On Second Scoop: Ice Cream Reviews: Epic Fail... or just Bad Luck? Epic Fail... or just Bad Luck? So, somehow, my wires have gotten a little crossed and there's not a whole lot of ice cream in the freezer right now... worse yet, none of it is terribly exciting. Oh, sure I had high hopes, but then it all fell apart. See, I decided to sit back and relax with a cute little pint of Breyers all natural cookies and cream ice cream last night. Just me, the pint, and a tv show or two. 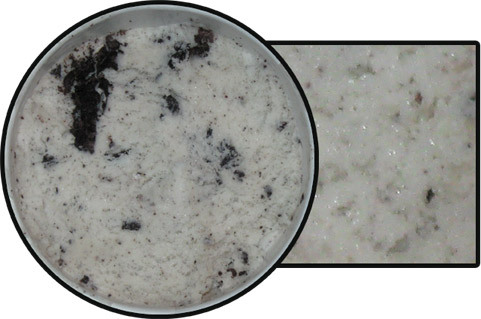 As I opened the container and grabbed a shot, I noticed that rather than being white, the ice cream kind of had this greyish tint to it. I looked close and saw what appeared to be a gazillion ice cream crystals mixed in. That can't be good. I dug in and my suspicions were right. The ice cream was downright terrible.... ok, ok, it was still technically edible, but Breyer's is getting a note from me about this batch. It's like watered down ice cream. No matter how far I dug down, it was still a solid mix of ice and cream. I've never seen anything like it. Just to make things worse, before I had some last night, I gave my daughter a small bowl for dessert with some crushed Christmas cookies on top (they were on sale, I couldn't resist!). She still enjoyed it, but I think it's because the abundant cookie bits distracted her. Stay tuned, I still have to finish a review from last Friday! Can't I blame them all? But seriously, I understand, but at the same time, I can only think of one blog entry where the pint was this badly crystallized.